Most people are defined by one thing–a job title, wealth, family, or a hobby. Las Vegas, Nevada’s Sierra Shaver doesn’t subscribe to that theory. 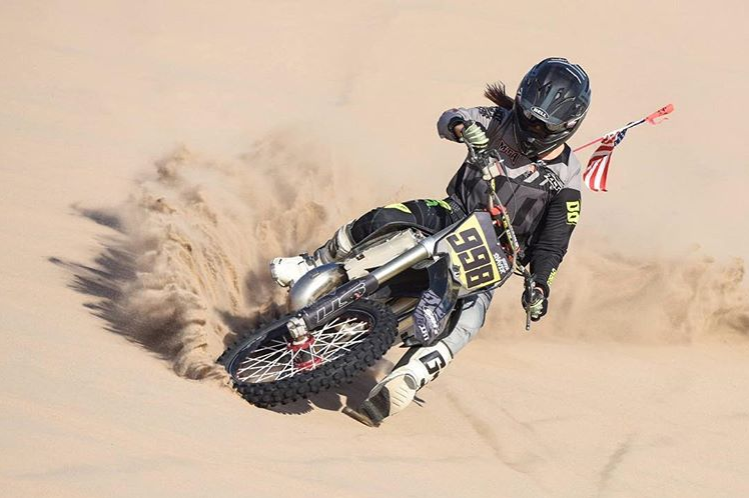 The 20-year-old WORCS and Best In The Desert (BITD) racer is a college student, full-time employee, off-road racing advocate, WORCS Champion, project bike builder, and was featured in last year’s “Makeup2Mud” segment that aired during the Monster Energy Supercross series. At 20 years of age, Shaver has seized opportunities and used various platforms (15.7 thousand followers on Instagram and growing) to spread her message. That message? Find ways to get more girls involved in off-road riding. We had an in-depth conversation with Sierra about a variety of topics. Ranging from motorcycle clubs to mechanic tech tips, her Wiseco Honda CR125, the two-stroke versus four-stroke debate, and much more, she is well versed and extremely insightful. Meet Sierra Shaver, female off-road philanthropist. What was it like being featured in the “Makeup2Mud” television segment that aired during last year’s Supercross series? Sierra: It opened my eyes to all of the other girls who participate in two-wheeled racing. It was a really cool experience. I have never been video recorded while I was riding, or doing an interview in front of television cameras. I had a good connection with the idea behind the project because I love the thought of more girls getting involved in the sport. I am currently trying to put together motorcycle clubs to get more girls involved. It’s an expensive sport and there’s a lot to it, so it’s difficult. Hopefully, the “Makeup2Mud” feature opened some eyes and helped girls realize that they can ride and race. I enjoyed how the feature allowed me to tell my own story. I loved the individuality of it. I come from a mechanical background. We don’t all come from the same place. We aren’t all born into racing. 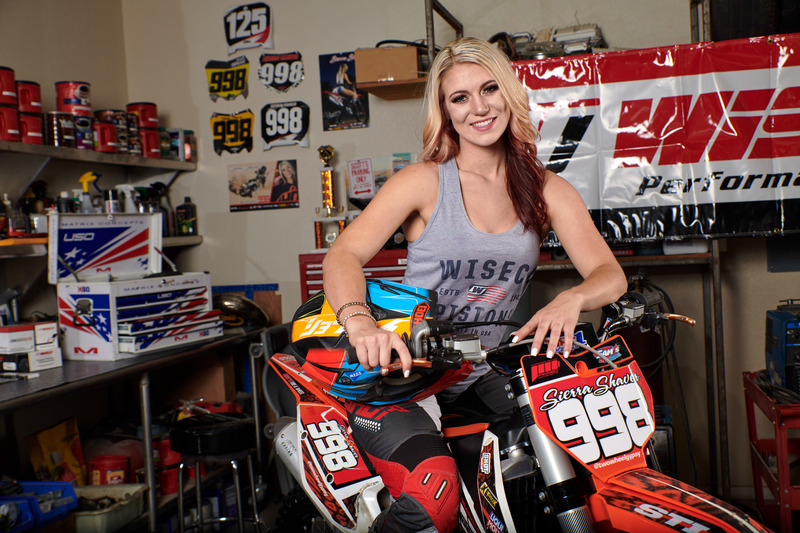 Sierra was born into the mechanical background of working on dirt bikes, but she knows many other potential riders are still awaiting their initial introduction to the sport, and she strives to provide that. Who influenced you to begin riding? Sierra: I was born into it. When I was 17 months old, my dad taught me how to ride a four-wheeler. He would steer for me, and I would press the throttle. Ever since I was a little girl, my family and I have gone to the dunes and camped. Every holiday we’ve celebrated, from Halloween to President’s Day, has been at the dunes. 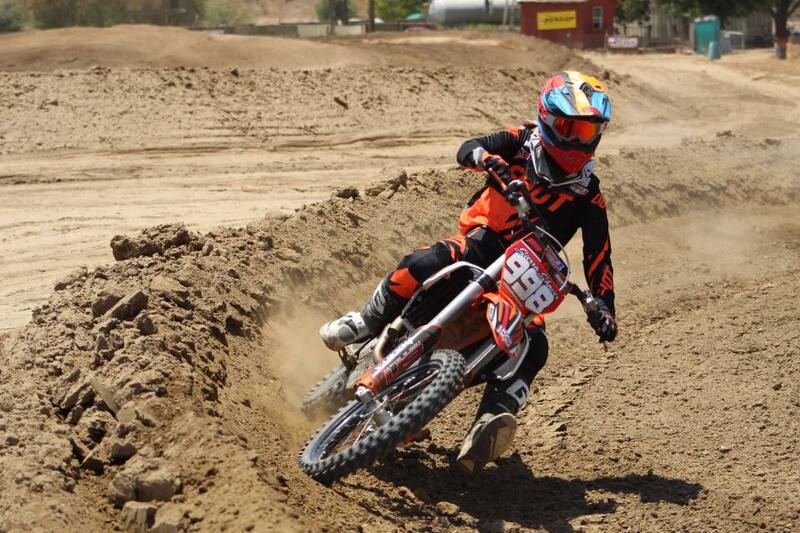 I slowly transferred into riding dirt bikes as I got older. Sierra's family has been spending weekends and holidays at the dunes since she was roughly one year old. She almost had no choice but to get into riding! At one point, you were pursuing a nursing career. Is that still the goal? Also, how do you juggle school with racing? Sierra: I switched my major to MRI technician and X-Ray technician. Nursing school required me to quit my job for two years. In order to continue racing, I had to figure out a way to pay for it. Balancing school with racing is challenging. Between working a full-time job, being a student in the medical field and racing full-time, I actually do very well. I’m the type of person who thrives when there’s a lot on my plate. It forces me to manage my time and focus on the things that I need to get done. Honestly, I don’t know what to do with myself when I have free time [laughter]. I’m always trying to hone my skills and improve myself. 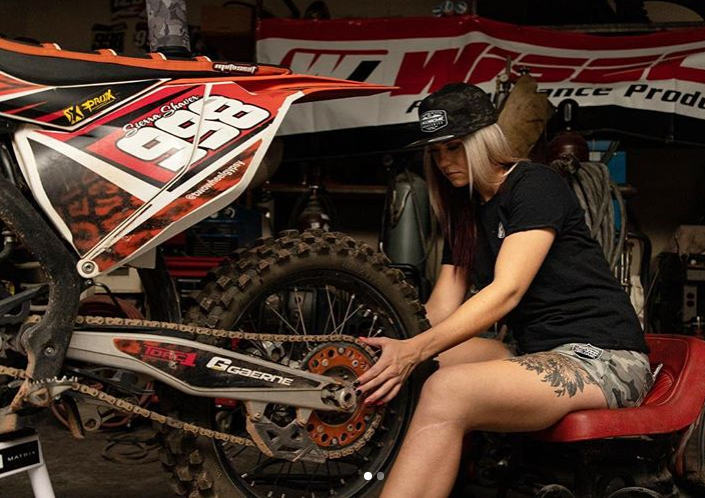 Sierra prefers the busy lifestyle, whether it's school, work, training, or wrenching on her bike, she'd rather be putting in work than doing nothing! You mentioned that you come from a mechanical background. Where does that stem from? Sierra: I learned from my dad. I have two sisters, and you could say that I was the most Tom-boy out of everyone. I was always out in the garage with my dad, asking him questions and bugging him while he was working on things. I have an interest in knowing how things work. My dad was a self-taught welder, so he passed on that knowledge to me. As far as changing tires and working on bikes, I started working at a motorcycle shop when I was 14 years old. I’m a very independent person, and I wanted to make my own money. The motorcycle shop took me under their wing, so to speak. I started out by cleaning bathrooms and other odd jobs, but worked my way up to the parts department. That facet of the business was super helpful to me, because I learned what parts go into a motorcycle. I was also taught how to work on my own bikes. From there I began building project bikes, which I love to do. I have built four or five bikes so far. You had a Wiseco-powered Honda CR125 two-stroke on display at the SEMA Show. What was your inspiration behind that bike build? Sierra: Believe it or not, I was gifted the Honda CR125 from a friend when I worked at the motorcycle shop. The bike was in rough shape, so I took it off his hands. Previously I had built two Honda CR250 two-strokes, and I absolutely love two-strokes. Since the CR125 required so much work, I stripped the bike down and started building from the frame up. While I had the bike apart, I went through every component. At the same time, Wiseco contacted me to see if I wanted to sign autographs at the SEMA Show. I jumped at the opportunity. Just like the “Makeup2Mud” feature, I knew it was a once-in-a-lifetime opportunity. I told Wiseco that I was building a CR125 and asked if they wanted to feature it at the show. They were all about it. I wanted to show a side of me where people could see that girls can race and also build their own project bikes. Sierra rebuilt a CR125 from the frame up with Wiseco engine internals. The bike ended up being featured at SEMA 2018, and Sierra talked to interested passerby and signed posters. Explain the different components that you used in the Honda CR125 two-stroke build. Sierra: Before I begin, I’d like to say that I’m very fortunate. Wiseco has provided me with full rider support sponsorship, which is amazing! I wanted to showcase Wiseco as my main sponsor on the Honda CR125 build as a way of saying ‘Thank you’ for their commitment to my program. I used a complete Wiseco clutch, along with a Garage Buddy complete engine rebuild kit. The kit comes with a crankshaft assembly, main bearings, gaskets, seals, o-rings, forged piston kit, small-end bearing, and an hour meter with a mounting bracket. It’s the complete package for an engine rebuild. Wiseco’s sister company, ProX, provided me with all their great products, as well. 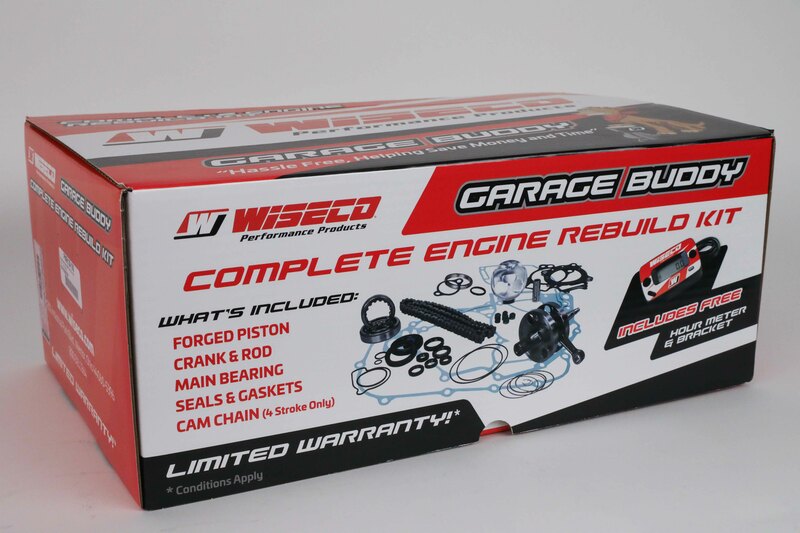 The CR125 engine was completely rebuilt with a Wiseco Garage Buddy Engine Rebuild Kit, as well as a complete Wiseco forged clutch kit. There’s a hot button debate between two-strokes versus four-strokes. What side are you on? Sierra: I started out by riding two-strokes. Two-strokes are easier to ride in sandy conditions, which is what I grew up riding in. I’m able to feather the clutch, the powerband is very responsive, and two-strokes are also lighter. There are pros and cons to each type of engine, but I do love them both. I learned to ride on a two-stroke, but quickly realized how much faster I am in corners in a four-stroke. I prefer a four-stroke for short course racing, where there are turns every 150 feet. I’m also able to control a four-stroke better off jumps and in the air. So, to answer the question, I love both. Sierra started out on two-strokes, but feels there are advantages to four-strokes as well. What was your biggest hurdle in learning how to race off-road? Sierra: I’m really good in endurance events, where the races last a long time. I tend to struggle at sprint-style racing, because I take about 40 minutes of racing to warm up and get comfortable with the terrain. Motocross didn’t fit for me. Since I grew up in the desert, I was naturally a better off-road rider. I know how to read terrain, which is an acquired skill. I like going fast. The four- and five-hour races are the most fun for me. I feel like I’m on an adventure and enjoy covering long distances. The biggest hurdle for me was learning how to be comfortable by myself for an extended period of time. Injuries are part of the sport, and getting hurt is always in the back of my mind. Once I was able to get past that fear, I realized that off-road racing is one big adventure. I love the adrenaline rush of going 85 miles per hour in the open desert. Smile at the obstacle in your way, see it as a challenge and bridge to a new platform 😉🤙🏼 place it in front of me and I’ll find a way! What are your top-three favorite places to ride off-road in the Southwestern United States? Sierra: I basically grew up riding the Dumont sand dunes outside of Las Vegas. I’ll always have a place in my heart for sand. Love it or hate it, riding in sand is a totally different experience. I know Dumont like the back of my hand. The Logandale Trail System in Overton, Nevada, is also a great place to ride. The best way I can describe it is like riding on a giant playground. It has bright orange beach sand, and there are big rock climbing sections made out of sandstone. There are two different extremes, which most people wouldn’t like if you’re starting out as a rider. All of my friends are better riders than me, which forces me to push my limits and learn. I feel like the better you become at riding technical sections, you improve at making quick decisions and managing different terrain. My other favorite place to ride is Cedar City, Utah, which is usually where the WORCS series holds a race every year. It has desert-style choppy sections. You’re going wide open for a full hour. There are ski jumps littered throughout the course, and you hit them super-fast and jump really far. You’re not jumping high, though, so it feels pretty safe. Sierra enjoys riding on all types of terrain, and the WORCS series has taken her from sand, to rocks, to stadiums. You recently suffered a knee injury. What happened? Also, how do you overcome an injury? Sierra: This is the second time I have injured the same knee. It hits home for me, because I had a plate and seven screws put in my knee the first time around. I broke my tibia, fibia, tore my meniscus and broke my wrist at Mesquite in Arizona. I drove myself to Urgent Care, and they transferred me to the trauma unit in Las Vegas. After the surgery, I was told that I would be on bed rest for seven months. That was the most devastating news I had ever been given. I’m a very active person, so it was a major struggle for me to sit around and heal. Luckily, I overcame the injury and won a BITD championship. That feeling of winning brought back the passion and excitement. Then I crashed and hit exactly where my metal was. I was devastated. My leg felt like it was torn from my body. I knew it would be a tough road. It has taken three months to even get a surgery date and find someone who would work on me. It’s a big mess, but I’m going to get surgery and come back. I have learned patience through this trying time. I get upset and depressed, but I remind myself to look at the positives and focus on coming back stronger. This next year I was supposed to turn Pro, but that won’t happen. Things happen for a reason. 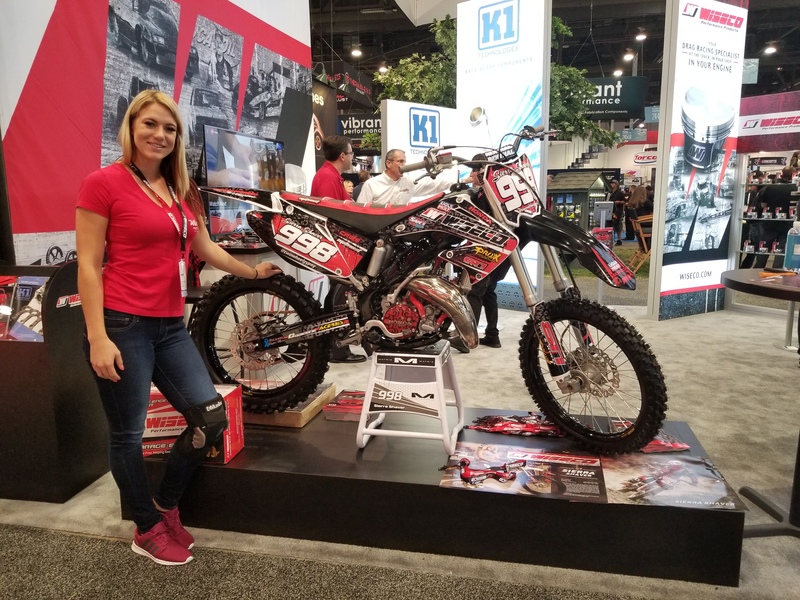 Despite her knee injury, Sierra was happily standing all day at SEMA to chat with fans and show off her CR125. What’s the number-one maintenance item that is overlooked by most motorcycle owners? Don't forget to grease your chain adjuster bolts! Those bolts seizing is one of the most common problems Sierra has seen come through the shop. Sierra: The chain adjusters, without question! Every time you take your rear axle out to change the chain or rear sprocket, you need to grease the chain adjusters. I always take my adjusters out, apply a thin layer of grease, and run them in and out of the swingarm a few times. I can’t tell you how many times I’ve had customers come in complaining about how their adjusters are stuck in their swingarm. The adjusters get seized in the aluminum, at which point you have to drill and tap the holes. It’s a really big pain. What’s it like racing a BITD event? Sierra: I love that type of racing, because it’s longer than a WORCS race. You’re racing the clock, and you’re doing it for four or five hours. I love doing BITD events by myself. I did Vegas to Reno on an all-girls team, and that was pretty fun, too. You race for 40 or 50 miles and go as fast as you possibly can, but then have to hand off the bike. It’s a giant relay race, and a lot of time can be made up. 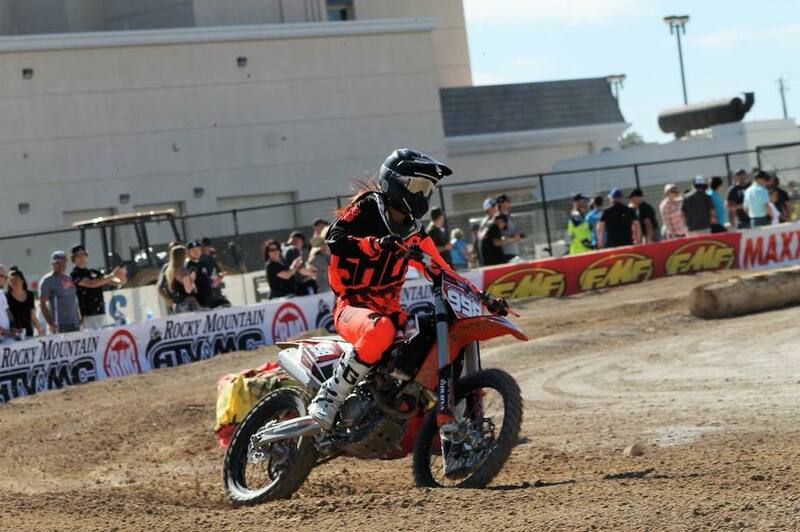 Last year, Sierra competed in the Vegas to Reno BITD round with some awesome teammates. What has been your most memorable racing experience? Sierra: I completed the 150-mile race in Parker all by myself. It’s a great feeling of accomplishment. I was able to race side-by-side with the trucks, which was pretty scary. I’ve been going out to the BITD races since I was little girl. My dad and I would walk to somewhere on the course where we probably weren’t allowed and watch the trucks pass by at full speed [laughter]. It was crazy to race with the trucks, but I knew how to look out for them. I had a front-row seat to seeing the trucks race through the desert. I was smiling from ear to ear. There’s no other feeling like racing through the desert. People probably think I’m insane [laughter]. What do you want to accomplish in the sport? Sierra: I want to be an influencer, more than just an athlete. I love racing and being involved, but if you’re a strict athlete, once you retire you’re mainly out of the picture. I want to influence and get more people involved in the sport. I made a club at the University of Las Vegas with a few of my friends. We bought a few bikes and were able to introduce people to the sport. Unfortunately, some of those friends graduated, so we weren’t able to continue due to funding. I want to get girls involved and teach people. Social media has been a great way to spread my message, and I love hearing from girls who say they are inspired by me. I never thought I would have that effect on some people. It has been awesome. Sierra wants to be an influencer and inspiration for people to get involved in the sport, whether it's just as a fan or learning how to ride! Is there a philosophy that you live by? Sierra: No matter the situation, I try to be a good sport, as well as a good all-around person. If I see someone standing alone at the races and looking withdrawn, I’ll try to start a conversation and make them feel welcome. I’ve realized that I learn something from everyone I talk to. It’s amazing how one conversation can change someone’s day. To see Sierra Shaver’s “Makeup2Mud” feature, visit https://www.youtube.com/watch?v=opKe-dufqhY. You can also follow her on Instagram @twowheelgypsy.